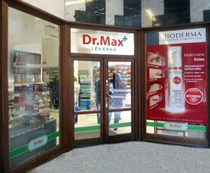 Dr. Max is one of the largest pharmacy chains in central Europe. As the market leading chemist in the Czech Republic, it has over 500 pharmacies serving 130,000 customers per day. Their most useful outlet in Prague is located near the centre of Wenceslas Square. To find it, go to the corner of Vodičkova (the road the trams run along) and Wenceslas Square. Dr. Max is the second building into Vodičkova, next to the Vodičkova tram stop, and just above the Mustek Metro station. Dr. Max sells an extensive range of pharmaceutical products, both on prescription and over the counter, including medicines to treat colds and flus and other common ailments. Staff can offer advice and assistance in Czech and in English. For a list of other pharmacies in the centre of Prague, see the Medical Information section on our Prague Tourist Information page.